Fibromyalgia is a relatively new diagnostic term used to describe a chronic disorder characterized by widespread musculoskeletal pain, fatigue, and multiple tender points. Pain moves from location to location and because the symptoms mimic other diseases diagnosis can be very difficult. According to the American College of Rheumatology, fibromyalgia affects 3 to 6 million Americans, primarily women of childbearing age, although men, children and the elderly may also be affected. The current criteria for a fibromyalgia diagnosis includes widespread joint and muscle pain that has been present for at least three months and pain at 11 or more of the 18 specific trigger points when the areas are pressed. Other symptoms that are less common but can occur are constipation or diarrhea, headache, difficulty concentrating, tingling sensation in the hands, and severe or excessive fatigue. To date no cause or cure for fibromyalgia is known, however, early studies suggest that careful attention to nutrition, along with diet and exercise may help. A study published in the British Medical Journal reports that patients who participated in aerobic exercises twice a week for an hour over a 12 week period, were twice as likely to report feeling “much better” or “very much better” than those who did not exercise. Acupuncture along with Chinese herbs and sound nutrition have been shown to effectively reduce the symptoms associated with fibromyalgia. At our center we have seen amazing results just with acupuncture alone, as it is known to reduce inflammation and spasm, as well as facilitate the body’s own release of endorphins (natural painkillers). At our center a program of care can be designed just for you. Acupuncture treatment, nutritional advice concerning diet and supplementation based on your health history, age, lifestyle, and current condition can all help you to feel better and deal with this frustrating and life changing condition. If you’re suffering please let us help. We have helped many of our patients reverse the symptoms of fibromyalgia and we are confident that we can help you too. And we do accept insurance for acupuncture treatment. 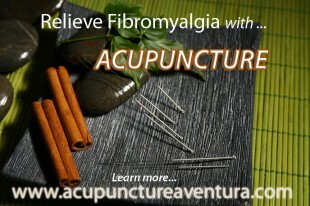 Please call 786-537-7022 to verify your coverage and to learn how acupuncture works for fibromyalgia.